Empty Fridge. Life Lessons. And Romantic News from the Salt Marsh. 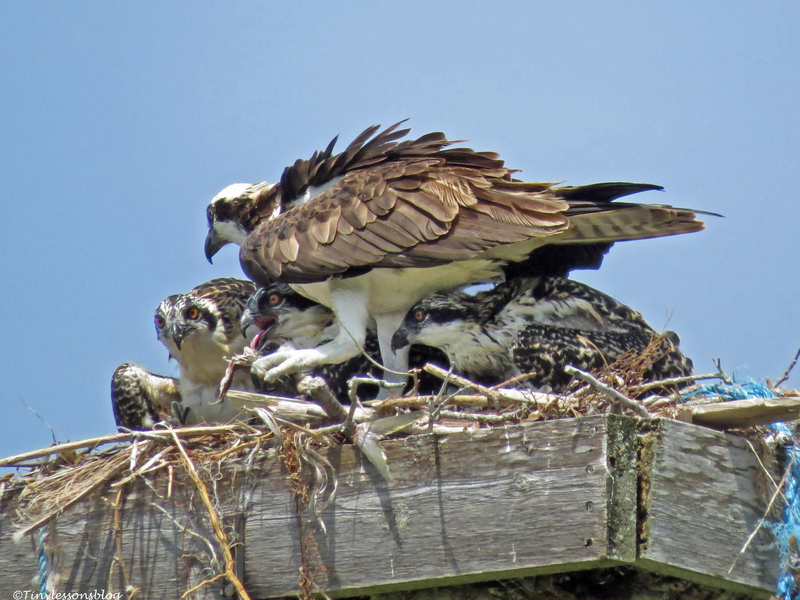 Mama Osprey’s fridge has been empty many times this week. The chicks are growing fast and have an endless appetite. Like teenagers usually do. When the meal time is over, all that’s left for Mama Sandy can be some shreds of a fish tail. A shred of a fish tail remains for Sandy’s lunch. 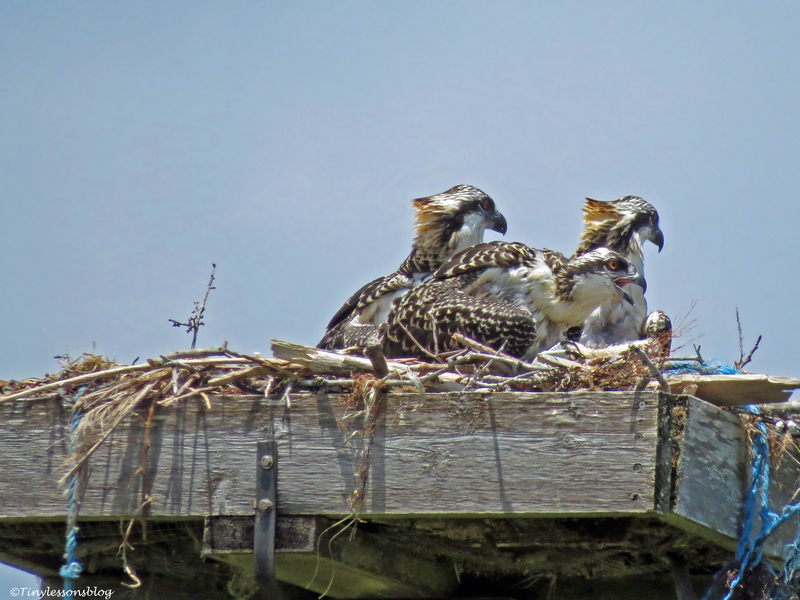 I’m no longer wondering why female ospreys lose 15% of their body weight during the nesting season. Sandy is a good example of a mom who always puts her chicks first. 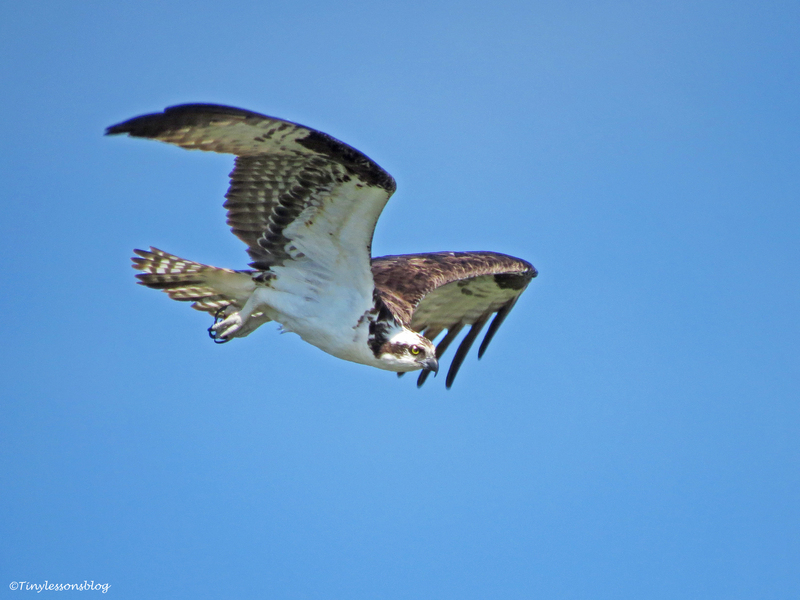 Male ospreys lose about 10% of their weight too. I guess the fish heads are not that filling. When the chicks were smaller, Stanley either waited in the nest until everyone had eaten or came back for the remaining tail. More recently he’s stopped waiting, and he doesn’t bother to come back to check for any leftovers. He knows there won’t be any. Stanley leaves after his drop-off. It’s been very hot this week, more like July-August temperatures. Luckily all three chicks are now big enough to be able to cool themselves. Sandy is still often protecting them from the hottest afternoon sun with her wings half-spread out. And the chicks are fluffing themselves up to let the sea breeze cool their skin. Sandy and one of the chicks managing the heat last weekend. The chicks are also learning the skill of watching for any dangers. The oldest one, in particular, often sits upright and helps Sandy to scan the skies. And s/he is also able to eat directly from the fish now, once the smaller siblings have been fed. Sandy checks out Tiny and one of the chicks scans the sky. I haven’t spotted Papa Stanley making a fish transport since last Sunday. But that’s not so strange because his visits to the nest now are all about dropping off the fish, which only takes a few seconds. I’m sure he’s still there. In any case Mama Sandy has started to fetch food too. 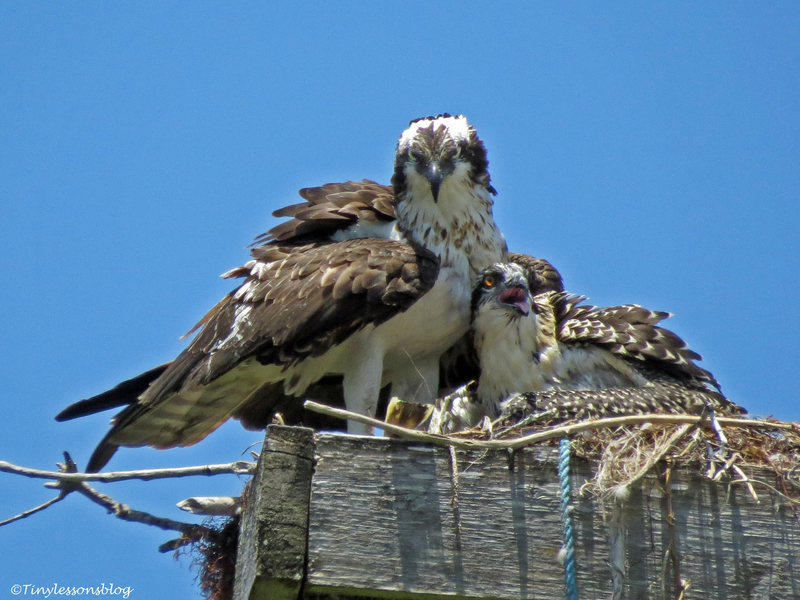 It’s common for osprey moms go back to work as soon as the kids are big enough to be left alone for a while. There’s a need to complement what dad brings in. This morning Sandy totally surprised me. And I think she surprised the chicks too. I heard the youngest chick ask for fish. She stretched herself up, looked over to the shallow part of the marsh. And off she went. I was taking a picture of the chicks alone in the nest – and whoops, she was back! With a fish. It took maybe about 30 seconds for her to pick up the fish from the water. I have never seen her fishing right there. Needless to say I was impressed. Here’s the sequence of Mama Sandy going to the neighborhood seven eleven. Then she just flies out … down into the marsh. The two oldest ones watch her, but the youngest one is just asking for fish. …and it’s a fairly big one. Otherwise everything is good around the salt marsh. The Red-winged Blackbird has made himself home and is busy singing his songs in one tree or another. I love to see him, but wouldn’t pay to download his songs. 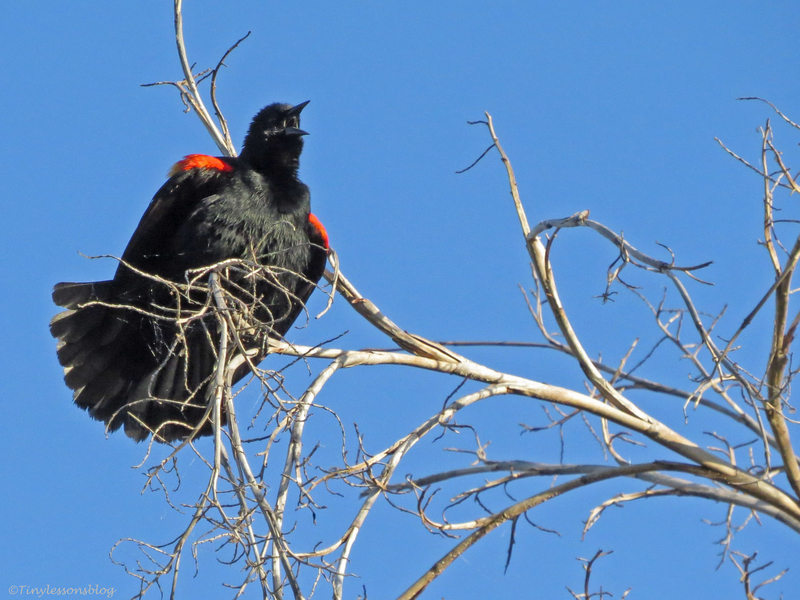 A Red-winged Blackbird sings to his heart’s delight. 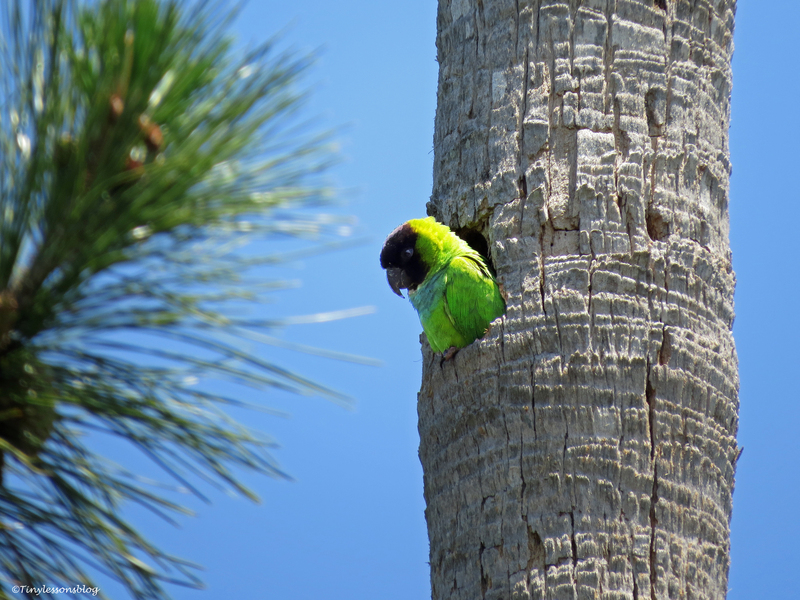 The Nanday Parakeet couple still lives happily in their condo apartment. The balcony and the patio perch come to good use in the heat. …and her hubby on their perch patio. The Red-bellied Woodpecker is still there, but no longer alone. He’s gotten hitched! It was impossible to persuade both of them to sit together and pose for the camera. I had to merge two pictures to show you how they play. 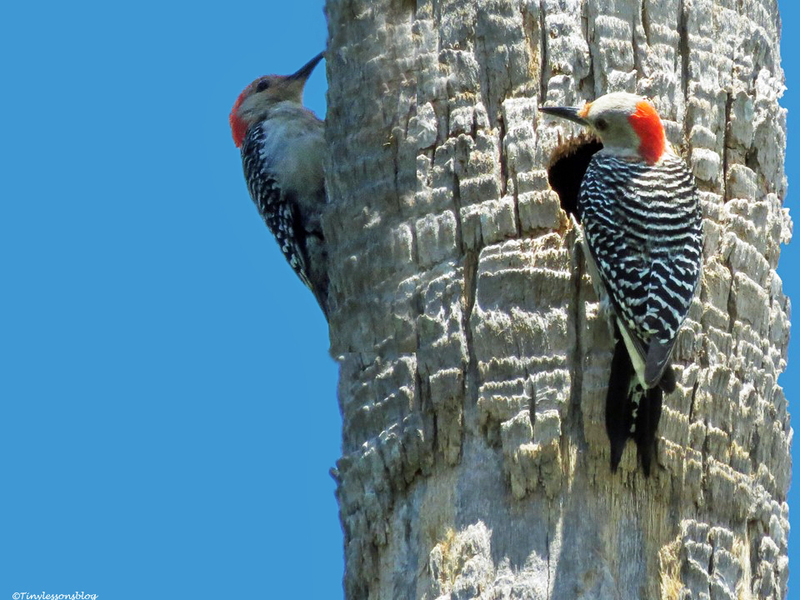 The Red-bellied Woodpecker couple close to their home. 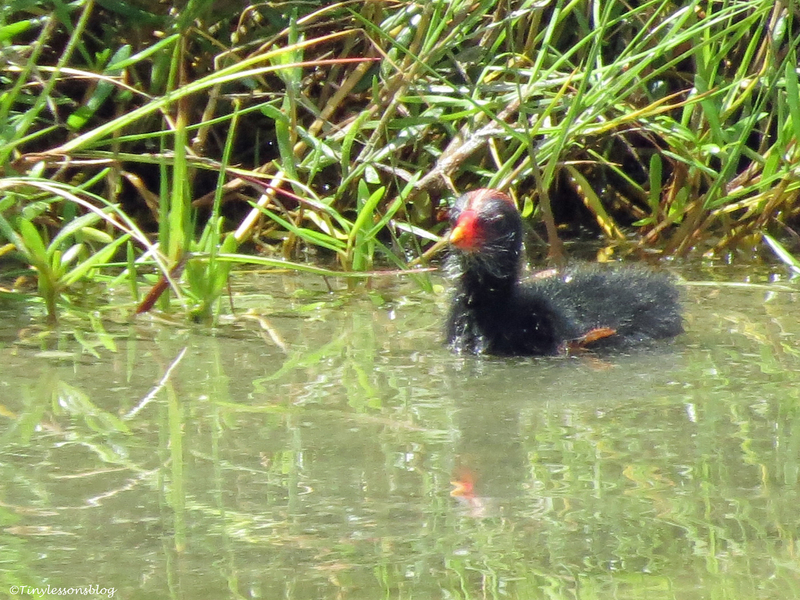 And the Moorhen chicks continue to grow. I’ve spotted them on most of my walks this week exploring their surroundings with mom and dad. One of the Moorhen chicks came out of the grass to explore a bit further. That’s all from the Salt Marsh News for this week. I hope you’re learning good life lessons too, and that your week is going great. Previous PostWPC Forces of Nature: The Many Faces of Storms (9 Images)Next PostBird Sanctuary. A Hospital, Rehab Facility and Last Resort Home for Injured Birds. I agree with Stephanie – great description – I feel that I’m right there watching too!! Wow Tiny! Your story and photos are the best! 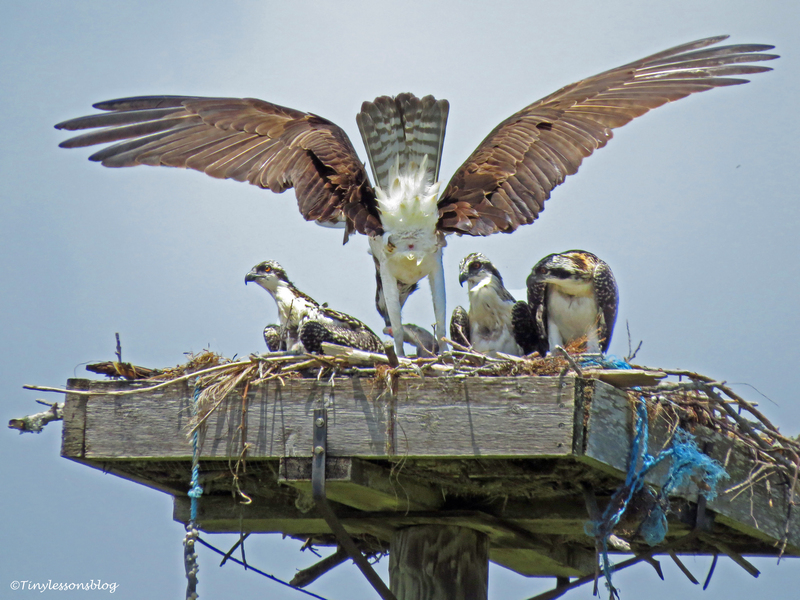 National Geographic standard, I so love your Osprey insights, being able to watch and observe is such a wonderful privilege. The highlight of my new childrens book which I am in the process of publishing focuses on what we can learn from Australian birds for doing life better. 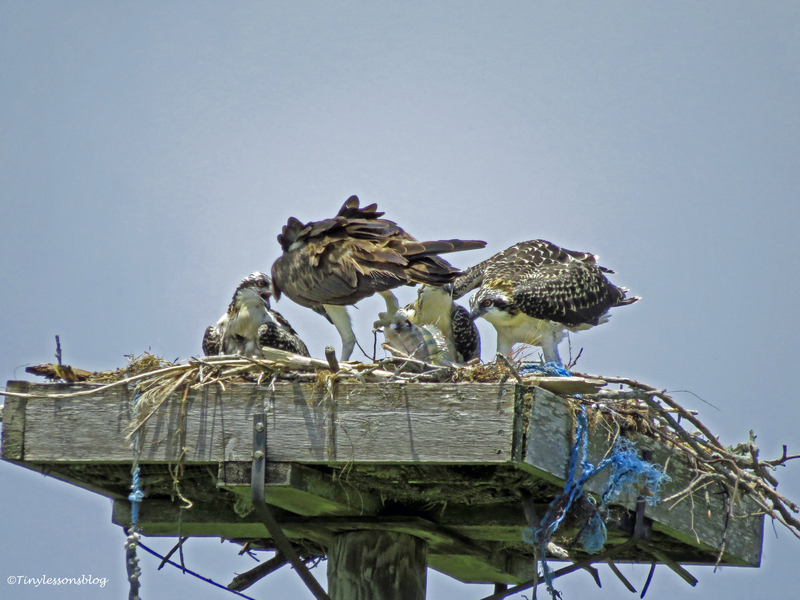 You have some great pictures and insights to form a story there and produce your own, just using the Osprey alone. I also love your other pics, the red-bellied woodpecker is quite a handsome bird. Your moorhen chicks look almost the same as our Dusky Moorhen chicks. Happy you enjoyed the update. I’m so grateful to have all these birds here in our park, right next door. I’ve been following the ospreys for about a year now and have learned so much (and read lots of research and other fact papers/books about them to learn to understand them better). A book might be a good idea…there is so much we can learn. Happy about your book project! I’m sure it’ll be a fascinating book. Love following the story of Sandy and Stanley and the babies! They are growing fast! Thanks Andy. Yes, the babies are growing so fast. Soon I’ll be able to make a fairly educated guess whether they are boys or girls. And then they’ll fledge and learn to fish for themselves. So fascinating watching how Sandy and Stanley raise the little ones. 🙂 These are great shots, Tiny. 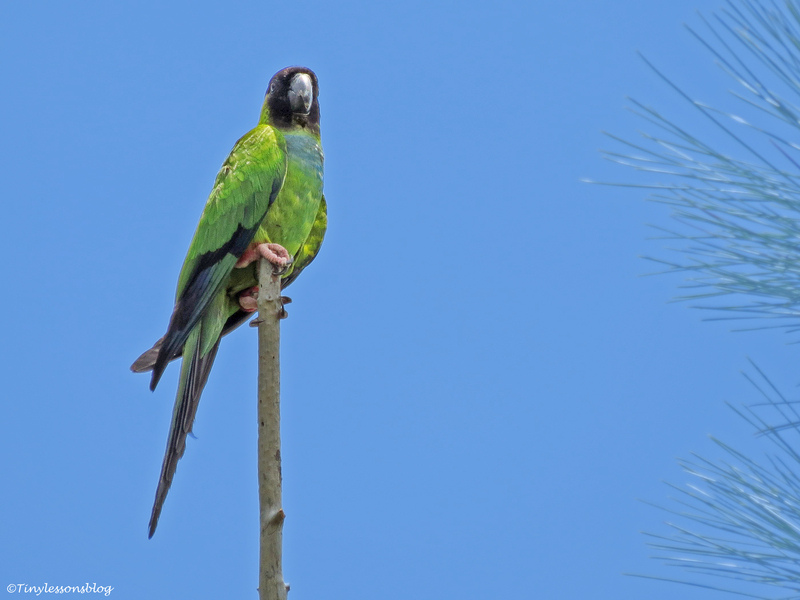 The parakeet and woodpeckers! 🙂 Thank you!! 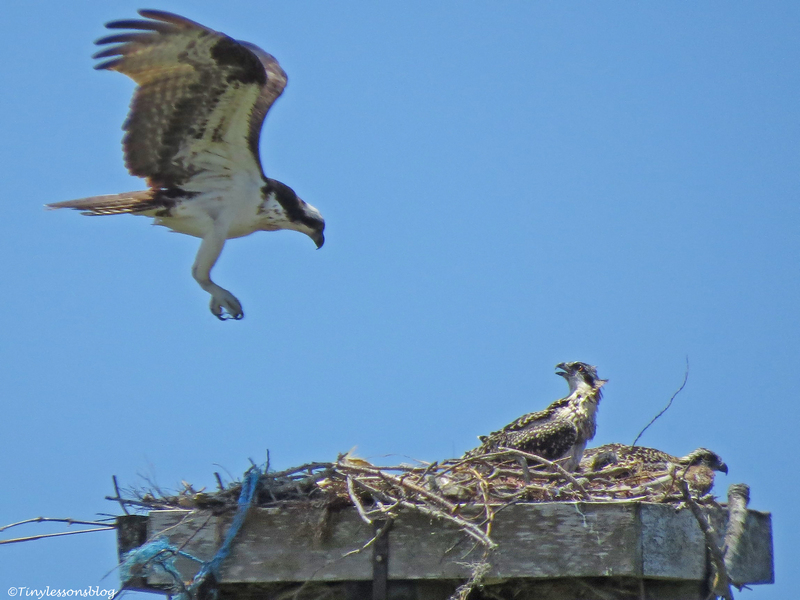 The baby osprey seem to grow so fast. No wonder they’re always eating. And it was interesting that the oldest was acting older, too. Love your narrative that goes with the awesome photos! I always chuckle. Thanks Hien! I agree that the Red-winged Blackbird is loud, his song is quite out of tune too 🙂 But I haven’t observed them dealing with other birds here around the marsh, so I haven’t seen them being brazen. So fascinating … and great shots Tiny! Its so much hard work for S and S … We humans are lucky in comparison! I noticed she’s peeking out much more now when it’s hot than just a week ago, practically hanging out from the French balcony 🙂 Hubby had the privilege to air himself on the perch nearby. The youngsters have gotten so big! If that heron is stupid enough to come back Sandy is away, he might be in for quite a surprise. Mom & Pop are no longer the only threat to his well-being! It’s amazing how dedicated and hard working the parents are. And I love how efficient mom is! She is impressive! I love her resourcefulness, caring and courage. 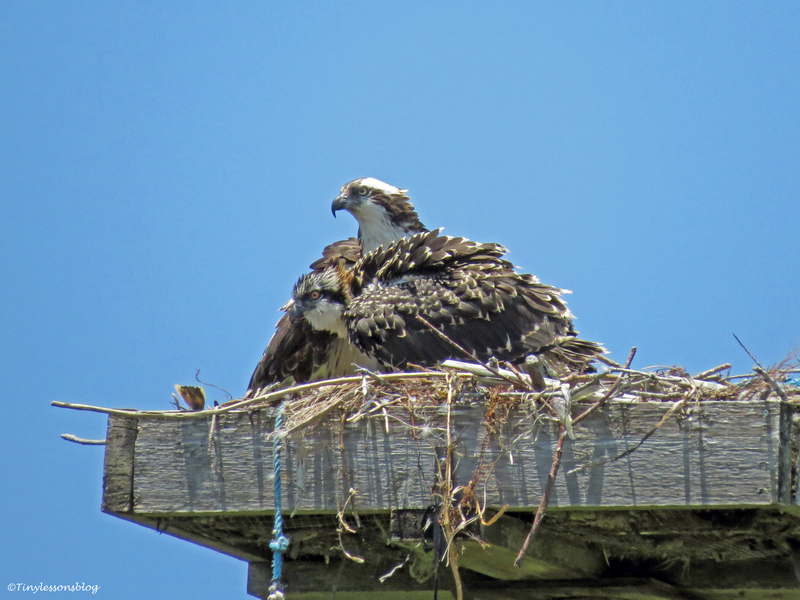 I also think (from watching them over last summer/fall) that Mama is a better fisher(wo)man than Papa, but please don’t tell him. Maternal instinct kicking in perhaps? Wonderful shots from the salt marsh, I am learning a lot. Thanks Susan. I’m learning a lot too, every time I go there and observe the birds. And I’m so happy I’m able to share what I learn. Mother never ceases to amaze me either, Tiny! There is a side to Her that I would rather not see, only the strong survive. On my walk yesterday, I found I tiny baby bird laying in the road, dead. I with great tenderness, picked him up, carrying him to the grass, and there, gently laid him down under a big leaf, saying a prayer as I did. 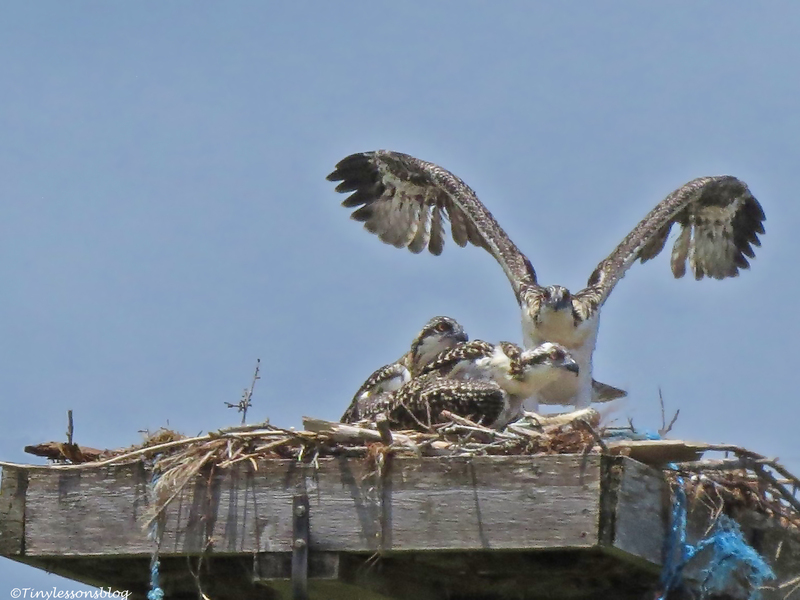 I’m so happy ALL babies in the Osprey family are healthy!!! That’s a difficult part for me too. Earlier today I visited a bird sanctuary, that also has a hospital for injured birds. It’s good there are a few places here and there that take care of birds that are not “perfect” or strong. The birds that heal enough to manage by themselves are released back to the wild, and those that do not heal completely get a “forever home” there. With a Loving and open Heart, it doesn’t get easier, Tiny, yet when we accept this is what IS, it helps. Music to my ears knowing there are people who really care. Thank you for telling me! Thanks for the comprehensive report of life down at the salt marsh. 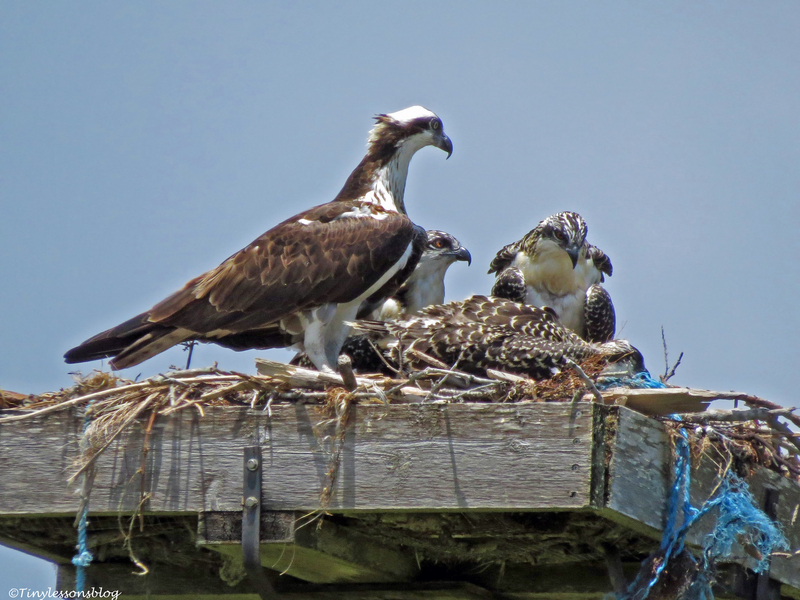 The osprey family is fascinating and so important we understand the cycle of life, keeping the waterways healthy so fish can live to feed the birds. Oh, it really is important for us to take much better care of the environment entrusted to us. I couldn’t agree with you more. Just came back from a visit to a bird sanctuary on the sun coast…most of the injuries to the birds there, both at the hospital and in the “home” were caused by man, in one way or another. Such gorgeous creatures. Thank you for catching their precious moments. It’s interesting how endlessly entertaining nature can be! Another set of fabulous photos! But the first is especially excellent! Happy you enjoyed them, Elena! THAT, is an amazing shot and a fierce looking Momma. Thank you David. Fierce sometimes helps when there’s a paparazzo around. For someone who claims not to be a real photographer, these are some nice pictures. Happy you liked it, Catherine. Lovely to catch up with the salt marsh families. I have been trying to do WordPress on my mobile lately. Not a satisfactory experience.